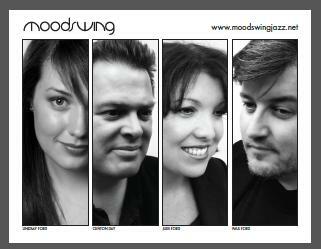 Download high-res (PDF, 1.47MB) promo glossy, with Moodswing logo, website, pictures, and names. MOODSWING: With two singers from (the former +4db), I was looking forward to what this group could do and was not surprised by the talent. Fantastic arrangements (they rightfully won in that category), and for four voices they did A LOT of vocal gymnastics that were simply outstanding! Paul (their bassman) did a "Harmonica solo" that had everyone's jaws drop to the floor! Watch out for this group next year. 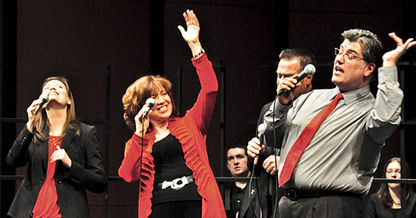 . .
With four lead vocalists whose collective range hits higher than Earth, Wind & Fire and lower than Johnny Cash, you might expect one of the singers in the Bay Area a cappella group Moodswing to give "American Idol" a shot. Inside Joke: Paul consistently calls the host by the wrong name (Dave, Ted, then Alan).